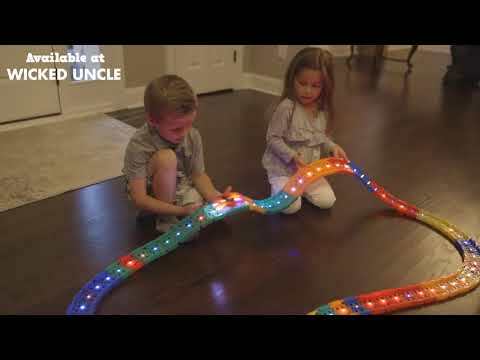 With 12 feet of twisty, flexible, light-up track and an LED light up race car, you can play Fast & Furious in your living room in no time! The LED power base uses a USB port to charge the car so it can operate without batteries. 49 LED track pieces connect super easily and light up in yellow, blue, green, and red, and the 80 other pieces of standard flexible track allow you to extend your racing territory up to 12 feet! Build tracks from tables to floors, around beds, in the backyard, through the kitchen and anywhere else you can think of. It's the train set of the 21st century! Size: 9.75" x 6.75" x 4.5"